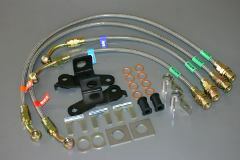 We added to our super lock brake line series a line for NC. 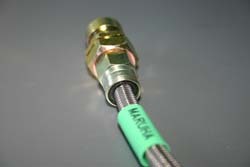 Maruha’s super lock brake line has high reliability, wide line-up and a reasonable price. It is a tuning brake line based on a new idea. In the case of NC which is completely different from the NA and NB models, the line is different too. The fitting’s (banjo) curve influences the line’s flow, safety and durability. Maruha’s brake line has the shape of the genuine line and it can easily follow the suspension action. In the case of the clamp we have to talk about its position (upper arm) in between the body and the caliper. The clamp position can be easily influenced by the line’s curve (the line is being fixed halfway at the clamp) and especially for tuning lines it is a place that has to be dealt with carefully. You can see how the line follows the suspension’s intense movement at the setup. To the front a steel stay is being used, however in the case of Maruha’s brake line a special stay is being set up individually. The yellow part is the olive (collar) and is stuck to the green inner at the red circle. The crimp force is obtained from the fixation of the blue and green springs. The center pin (green) uses the collar (yellow), and it is strengthened by caulking that’s why it is safe. The red fitting part is Swivel’s structure and it can be rotated. In this way the managing of the line becomes easy. At the fitting’s neck an O ring (black) has been set up, which protects the line from dust and meddling. 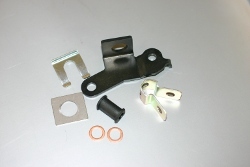 Compared to the former models, it is a super lock type with a stronger fitting part. 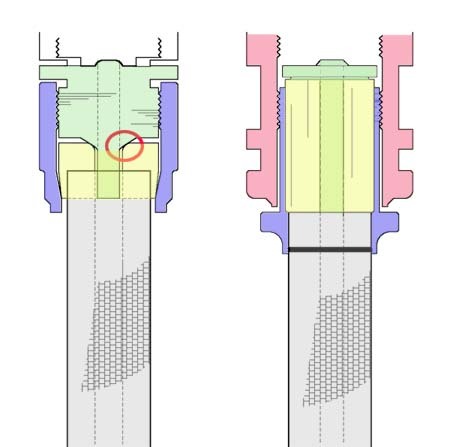 In the case of fitting, generally to the tip of the line an olive collar is set up (image below – yellow part) and this part is being stuck to the fitting inner preventing the fluid from leaking. At the time of fitting the crimp force uses the spring pressure. Maruha’s super lock series don’t use the spring’s force, but strengthen the collar from 8 sides and make it more solid. 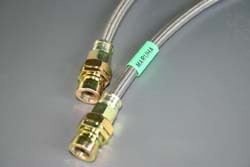 The fitting of the genuine hose is made by caulking and Maruha’s line’s logic is the same. It’s not about putting together parts for each type of car, but producing products for each type of car. The brake line’s inner part is Teflon made by the company Dupont. The outer is stainless steel overbraid and there is a plastic tube around it. The outer tube protects the outside from meddling. In the case of Maruha’s brake line the fitting part is steel, plating is carried out and for this reason it has an antirust effect. The car side’s genuine brake pipe is steel too. In the case of Maruha’s line we used an O-ring to protect the line and the fitting from meddling.